Tiny piecing alert! 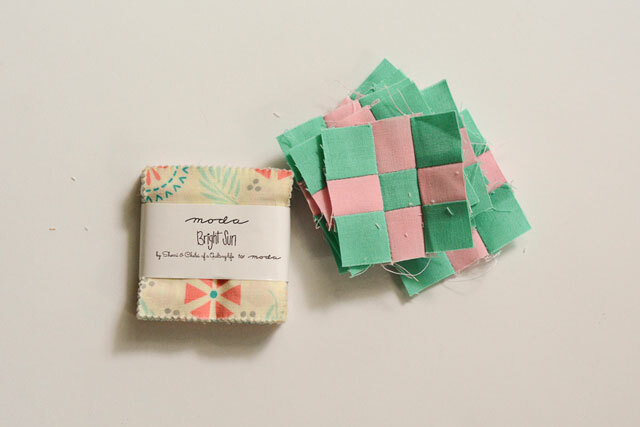 At 12″ square this mini quilt could pass for a quilt block – but it’s small size is the perfect way to play around with small piecing and highlight one of your favorite fabric collections. All you need is a Moda candy and some solids. 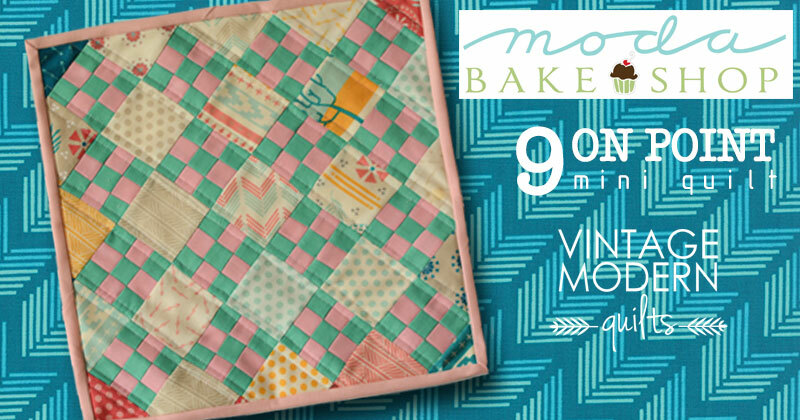 This mini quilt finishes at 12″ square. From two dark Jelly Roll® strips, cut (3) 1 3/16″ strips. From one light Jelly Roll® strip, cut (2) 1 3/16″ strip. Cut each of these strips in half. Make 2 dark-light-dark strip sets and cut into (32) 1 3/16″ sections. Make 1 light-dark-light strip set and cut into (16) 1 3/16″ sections. Combine as shown to create 9-patches. Choose 25 squares from the Moda Candy pack. Join in rows with 9-patches as shown below. Press and starch completed mini quilt top. Trim as shown using a 12 1/2″ square ruler. Layer up with backing and batting fabric. Quilt as desired and bind with remaining fat quarter. 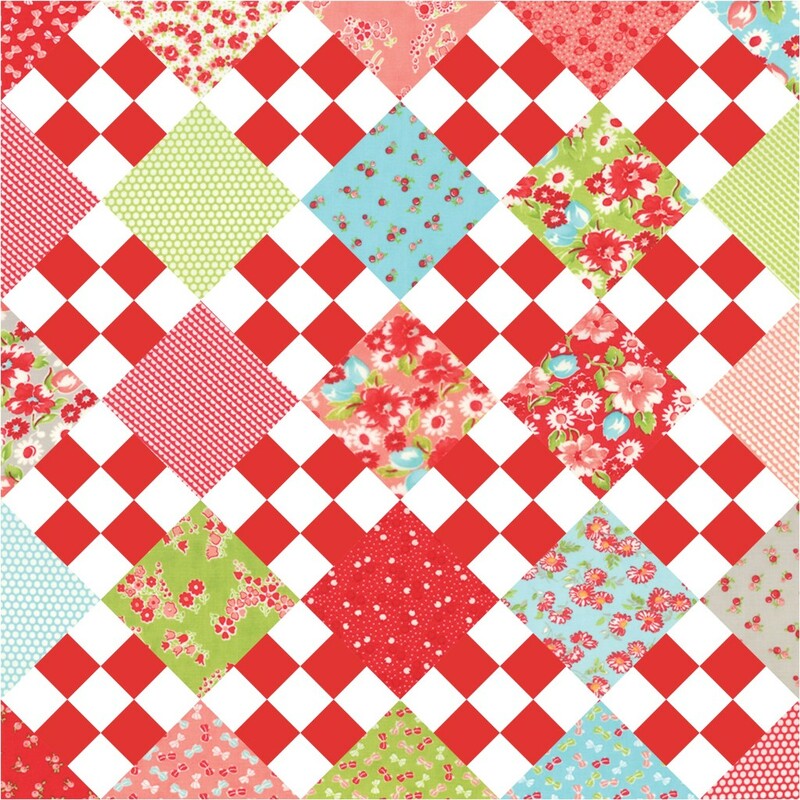 This fun block makes a darling mini quilt or make a few more and you’ve got a quilt top! 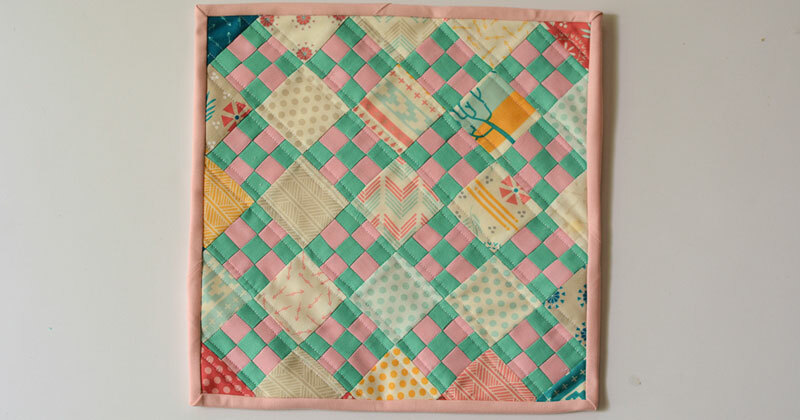 This entry was posted in Moda Candy/Mini Charms/Petit Fours, Moderate, Quilt and tagged Bonnie and Camille, Bright Sun, Little Ruby, Sherri and Chelsi, Vintage Modern Quilts. Oh wow! What a way to start the week, this little one is super cute. I have the perfect Moda charms for it and I’m up for making it work on point. A good practice in a small pack of a dynamite quilt. Thank you for sharing your talent. At first I thought I read it wrong! 12 inches! You are talented! What a great little challenge! This is great!!! I DO have some leftover jelly strips, and several candies…I am thinking maybe a “longterm” block project….those nines are sooo cute!!! Thanks for a great idea! Love it. 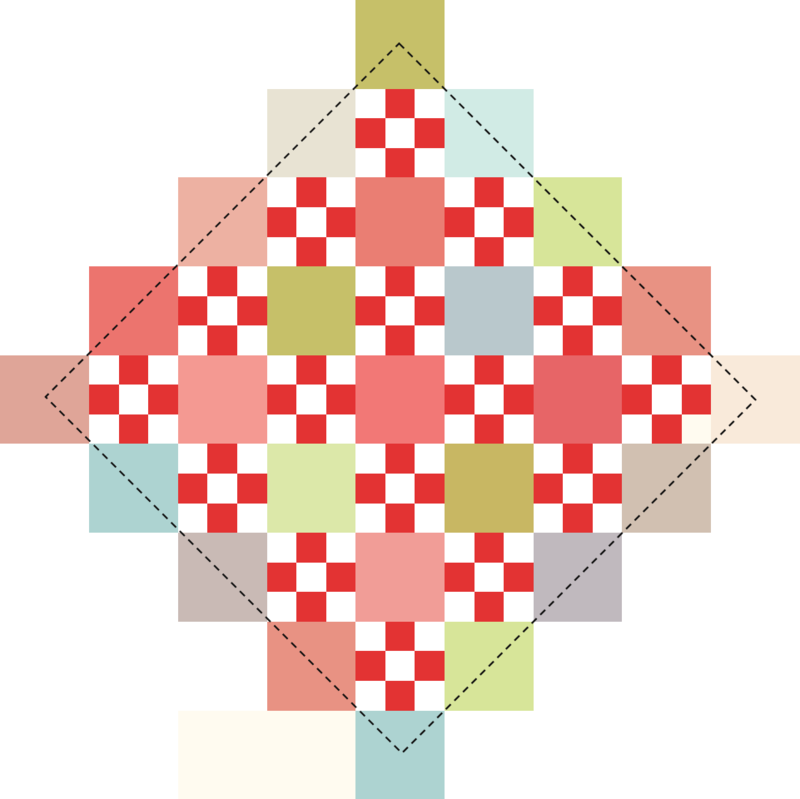 The Red and white mini quilt you show is backwards to the directions. 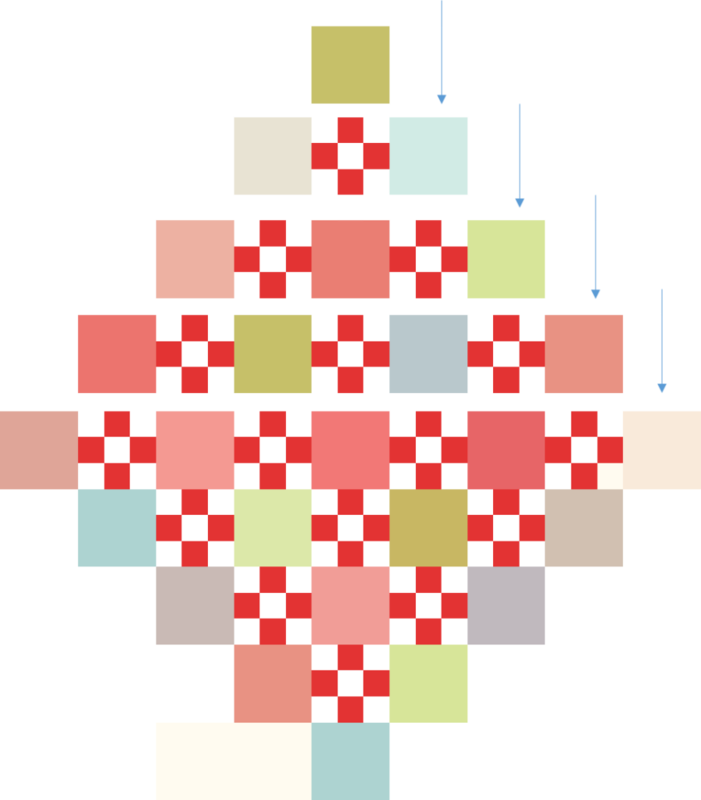 For it, one needs 16 of the red/white/red and 32 of the white/red/white for it to look like your example.